Posted on March 26, 2017 by Dan C.
15 When they had finished breakfast, Jesus said to Simon Peter, “Simon, son of John, do you love me more than these?” He said to him, “Yes, Lord; you know that I love you.” He said to him, “Feed my lambs.” 16 He said to him a second time, “Simon, son of John, do you love me?” He said to him, “Yes, Lord; you know that I love you.” He said to him, “Tend my sheep.” 17 He said to him the third time, “Simon, son of John, do you love me?” Peter was grieved because he said to him the third time, “Do you love me?” and he said to him, “Lord, you know everything; you know that I love you.” Jesus said to him, “Feed my sheep”. 7 of Jesus’ Disciples had returned to their previous occupation of fishing (for real fish instead of men), had fished all night and caught nothing. A man (Jesus) on the shore and called out to them and told them to toss their net on the right side of the boat instead of the left, which had not resulted in a single minnow, much less any fish. They obeyed and had such a haul they couldn’t get all the fish into their boat. You might say that Jesus told Peter to become a sheep herder! He told him to take care of sheep, young ones and older ones. Has that ever happened to you? Read a story many times and suddenly something literally jumps out at you? First of all Jesus said “Feed MY sheep. Those needing care and nurture belong to Christ, not to Peter, not a particular group of believers, but to Jesus himself! Pastors, Sunday school teachers, Bible study leaders, you are to care for JESUS property! That knowledge should give you great pause, should it not? Secondly, Jesus told Peter to “Feed my SHEEP, tending them and nurturing them to maturity. That should tell us in no uncertain terms the purpose of the church, Christ’s church, not yours. The mission of the church is the care and feeding of the sheep of God. Should ‘goats’ be invited and welcome in our churches? By all means! The main reason the church exists however, is for the ‘sheep of God’, not the’ goats of the world’. The ‘world’ in Jesus’ time hated him and the world in our time will hate us when we stand for the true gospel that Christ came to save men from their sin, not to fulfill their wildest dreams. In other words, the aroma of Christ is sweet to the ‘sheep of God’ but that same aroma of Christ smells like death and destruction to the ‘goats of the world’. So why do we do what we do? We try to make Christ and his gospel smell sweet to the stony hearted unbeliever to get them through the doors and then tell them that Christ died for their self-fulfillment rather than for their sin. After all, we know that if we start talking about sin the ‘bait and switch’ will be on and oh so obvious to the goats you lured through the church doors. Unless God is doing a supernatural ‘heart work’, they’re walking and they ain’t coming back any time soon! What’s the answer to this mess? Whether it’s a church setting or personal evangelism, it’s really quite simple. 1. Pray that God open hearts to hear the true gospel. 2. Preach the true gospel. 3. Leave the ‘saving’ to God. Posted on March 14, 2017 by Dan C.
Hot on the release of the mediocre film The Shack (18% approval rating by critics on Rotten Tomatoes, 6.8 viewer rating on IMDb), the book’s author William Paul Young has released Lies We Believe About God. It came out March 7, less than a week after The Shack hit theaters. If there was any question about Young’s theology, this book leaves no doubt. Personally, I had no questions about what Young believes about God — it’s all in The Shack. But this hasn’t stopped scores of people from defending the book/movie as “just a story.” For example, rapper Lecrae, featured on the film’s soundtrack, defended it as just fiction and not theology, as though fiction gets a pass when it comes to the scrutiny God commands we are to give everything (1 Thessalonians 5:21). Kruger returned the favor by writing the forward to Young’s book Lies We Believe About God. And it’s a really weird forward. It’s almost as if Kruger is saying, “I know the stuff you’re going to read in this book is kind of wonky, but I can verify that William Paul Young is still a Christian!” In actuality, Young in his own words exposes himself as a heretic. Again, we shouldn’t be surprised. He already did this in The Shack. All of Young’s chapters in the book are “lies we believe about God.” There are 28 of them, chock full of man-centered doctrine. It’s not kind-of man-centered. It’s all man-centered. Here are ten of the titles of these chapters and the theology they contain. Again, the titles are all “lies” Young says most people believe about God. And again, I must emphasize Young believes this is a lie. He goes as far as saying that there are pastors who are allowed to stand in their pulpits and preach this lie that people are not good. Young has a tenuous relationship with the Bible. Sometimes entire chapters of his don’t contain a single verse. So we don’t know how Young deals with passages like Romans 3:12 which says, “No one does good,” or verse 23 which says, “For all have sinned and fall short of the glory of God.” Young repeats the liberal theological trope that everything God makes is good, and since I’m made in the image of God, I am good. But he misses the reality of original sin: since Adam, we have taken that image and desecrated it with our sin, exalting ourselves in the place of God, and for that we deserve His holy and divine wrath. Jesus, the only good man there ever was, satisfied the wrath of God with His sacrifice on the cross. All who believe in Jesus will live. That gospel message does not exist in Young’s theology. Yes, Young actually believes that God is not in control. He says, “God has the creative audacity to build purpose out of the evil we generate, but that will never justify what is wrong. Nothing, not even the salvation of the entire cosmos, could ever justify a horrific torture device called a ‘cross. '” Does Young just not know that the Bible addresses this very thing? Peter preached at Pentecost, “This Jesus, delivered up according to the definite plan and foreknowledge of God, you crucified and killed by the hands of lawless men” (Acts 2:23). God foreordains, but this in no way absolves men from the guilt of his evil acts. What we mean for evil, God always means for good (Genesis 50:20). We are responsible to turn from sin and to Christ for forgiveness. Young comes back over and over to the fact that we are created in the image of God and proceeds to draw false conclusions: Since I’m made in God’s image, whatever I’m like, God must be like that. Since I have to submit, then God also has to submit. Young also believes the Father submits to the Son. He does not. Young goes as far as saying God even has to abide by the golden rule: He treats us the way He wants us to treat Him. But Jesus serving us (Matthew 20:28) is not the same thing as submission. To submit means to yield to authority. We have no authority over God. Absolutely zero. The only person Jesus submitted to was His Father in heaven. He submitted to God and served us as the ultimate example of what it means to love God with all your heart, and love your neighbor as yourself. This fulfills the law and the prophets (Matthew 5:17, 7:12). Young tells a very remarkable story about how his mother saved an infant child who then grew up to become an Anglican priest who tells Young’s mother that Young was right to make God in The Shack into a large black woman named Papa. Ugh. He took a true, very heart-felt and inspirational story, and turned it into something self-centered and pretentious. Young says God possesses feminine qualities (nurse, mother, etc. ); therefore, He can be a woman, too. Again, it’s all man-centered and feelings-based, not biblical. God created man to be the head of the wife as Christ is the head of the church. The husband is to be a picture of Christ laying His life down for the church, the wife is a picture of the church submitting to Christ, and the head of Christ is God our Father (1 Corinthians 11:3, Ephesians 5:22-33). For all Young’s talk about “submission,” the one thing he doesn’t seem to want to submit to is the Bible. Since Young has already revealed himself as a universalist, surely you know he doesn’t believe anyone goes to hell. In fact, he quotes Romans 8:38-39 which says nothing will be able to separate us from the love of God. Therefore, hell cannot be a place where we are separated from God. Rather, Young says, hell is God. It is “the continuous and confrontational presence of fiery Love and Goodness and Freedom that intends to destroy every vestige of evil and darkness that prevents us from being fully free and fully alive.” But Jesus said those who do not believe in Him and do the will of His Father in heaven will go away into eternal punishment at the final judgment (Matthew 25:46, Revelation 21:8). Hell is a real place that real people will be cast into unless they in this life repent of sin and follow Jesus Christ. The Bible could not be more clear. Young says God didn’t come up with the cross — we did. Again, the Bible addresses this point. See above. The Bible foretold that Christ would be crucified centuries before crucifixion was even invented (Psalm 22:16). This is not because God looked down the tunnel of time and learned something about the future, as though God needed to learn anything. That is a pagan myth rooted in fortune-telling and soothsaying. God knows the future because He foreordained it. This again is something presented in The Shack, that everyone is God’s child. Logically, if everyone is made in the image of God, and everyone is good, and everyone is going to go to heaven, then of course according to Young, everyone is a child of God. He takes out of context a passage from Ephesians 4 to back up his point. But he missed the one in Ephesians 2 that says before we come to Christ, we are children of the devil subject to the wrath of God (see also John 8:44). God adopts us into His family through Jesus Christ, and we become the adopted sons and daughters of God (Ephesians 1:4-5, Romans 8:15, Galatians 4:4-7, 1 John 3:1). Indeed, not everyone is a child of God. Only those who are followers of Jesus are children of God. Again, we’re created in the image of God, and God doesn’t create anything bad. Sin, according to Young, “is anything that negates or diminishes or misrepresents the truth of who you are, no matter how pretty or ugly that is.” He then goes into a bunch of Osteenian affirmations of who the Bible says you are: “You are trustworthy! You have integrity! You are loving!” No, you’re not. The Bible says very specifically what sin is: “Sin is lawlessness” (1 John 3:4). It is willful, open rebellion against the High King of the universe. Everyone has done it (Romans 3:23) and everyone deserves death for it (Romans 6:23). But the free gift of God is eternal life through Jesus Christ our Lord for all who believe. Those who are in Christ will turn from a life of sin and pursue the righteousness of God. EDIT: Someone asked me if in the book Young said Jesus was guilty of sin. Not exactly. Young postulates that Jesus made mistakes, like He misspelled a word or hammered a nail in the wrong place. His definition of sin is actually too soft for him to say that Jesus sinned. He basically says you are capable of living the human experience perfectly like Jesus did. Sin is when we think less of ourselves than we really are. It’s still heresy because it’s works-righteousness and if we say we don’t sin His word is not in us (1 John 1:10). 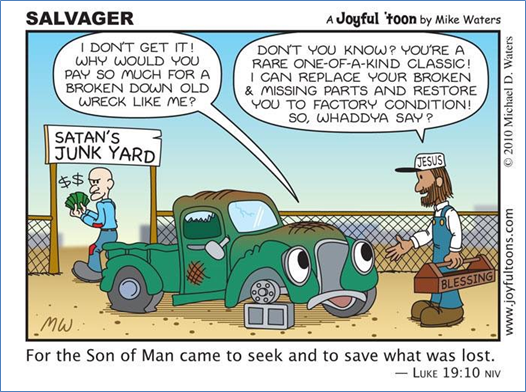 But Young doesn’t commit the added error of accusing Jesus of sinning against God. Young says that the God who “needs to be appeased, and failure is met by wrath and judgment” is a false one. Unfortunately for Young, that’s the God of the Bible, only it’s not the whole picture. He is indeed a God of wrath and judgment, but He is also a God of love and mercy. Young says those two things cannot co-exist. God says that they do (Exodus 34:6-7). He displays the full spectrum of His glory by saving for Himself the objects of His mercy, and pouring out judgment on vessels of wrath prepared for destruction (Romans 9:22-23). God is eternally gracious toward those whom He has saved and adopted as His children. He is eternally wrathful toward those who have rebelled against Him and rejected His Son. Repent of your sin and believe in Jesus Christ as Savior, and be saved from the coming judgment. Young closes his book by presenting a quote from the god of The Shack, and says that’s the god he believes in. Quite literally, he says the god he believes in is the god he invented in his own story. The Shack is a story, and it is a lie from the heart of a liar. With this new book, Young set out to “expose” lies we believe about God. Instead, he presented a lot of lies he believes about God. Posted on March 11, 2017 by Dan C.